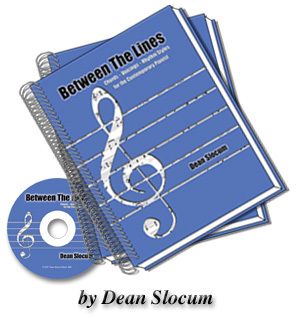 Between the Lines is a comprehensive print and audio course for pianists and keyboard players desiring to learn chords, voicings and contemporary rhythm styles. DO YOU NEED THIS COURSE BOOK AND CD? • You’re a Classically-trained pianist who aspires to learn contemporary styles. • You need to know what to play when you’re reading from a chord chart. • You’re a piano teacher wishing to help your students learn contemporary styles. • You’re a church musician in need of further skills in Praise and Worship. • You’re a gigging musician desiring to expand your knowledge and technique. THEN THIS COURSE WAS WRITTEN FOR YOU! If you’re comfortable with standard music notation, this course was written for you! There are 126 music notation examples that will take you from the basics through advanced chord harmony, covering all the rhythm styles you need to know, and all within your comfort zone. The included audio CD has 49 tracks–over 74 minutes of play-along music. The charts to every track are printed in the course book and identified by track number. Use your reading skills to effortlessly gain the knowledge and master the techniques of contemporary music. Very soon, you’ll know how to read Between the Lines. Purchase Between the Lines 176-page course book and CD for only $79.99. Flat $7.99 shipping, even when ordering multiple copies. "I love piano! Dean Slocum is an exceptional musician and I enjoy singing with his wonderful accompaniment. I have watched Dean work on his book, Between the Lines, as we have toured together. I know it will become a valuable asset for any keyboard player." Chords of the Major Scale. Click here to see 2- and 3-note jazz voicings from Chapter Six, Voicings: Sixth, Seventh, and Other Four-Note Chords. Click here to see a sample of Chapter Nine, Rhythm and Performance Styles. It includes a complete and very contemporary arrangement of It Is Well with My Soul, and examples of Rock and Roll, contemporary ballad and Southern Gospel styles.